Big Peat 26 years old (D.1992, B.2018) The Platinum Edition /51,5%/ – In 2018 Douglas Laing & Co. one of the most renowned Scottish independent bottlers celebrated its 70th Anniversary (the company was founded in 1948 by Fred Douglas Laing). The year has been filled with special releases but crème de la crème came out at the end of the year – Port Ellen 1982, part of XOP Platinum range and Big Peat 26 years old The Platinum Edition, a limited release of 3000 bottles. The latter is a follow up to 2017 Big Peat 25 years old Gold Edition. 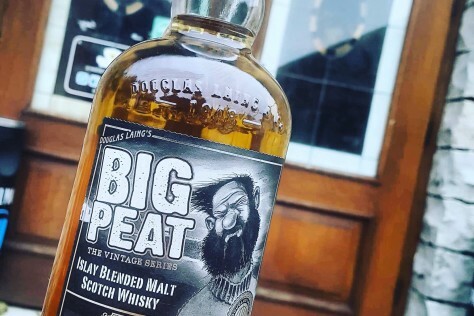 In 2019 we should see release of Big Peat Black 27 years old as a final chapter of the trilogy. The formula of Big Peat consists of Islay single malts with emphasize on Ardbeg, Bowmore, Caol Ila and Port Ellen. All components of Big Peat the Platinum Edition were distilled in 1992. Nose: barbecue on the beach, tarry ropes, seaweed, smoked bacon, hints of raisins and figs and touch of varnish. Palate: peat smoke, pine resin, seaweed salad, burnt toast, black pepper, nutmeg, licorice, milk chocolate, sea salt and touch of wax. Finish: long, with notes of peat smoke, cigar ash, charred meat, dried herbs, pepper and oak. Buy bottle at Dom Whisky Online or in our whisky shop in Reda, Wejherowska 67.